USA Flags. Proclaim your American pride by flying these red, white and blue flags! Line your sidewalk or patio with these red, white and blue flags. Guests of your Fourth of July celebration will enjoy flying this traditional symbol high! Makes the perfect backdrop for your fireworks display! 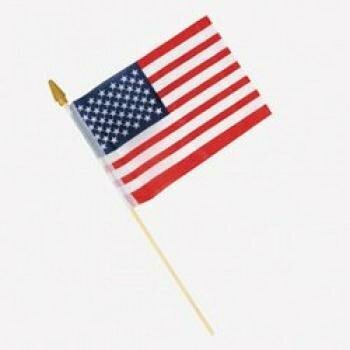 Each 6" polyester flag is on a plastic stick. Made in the USA.